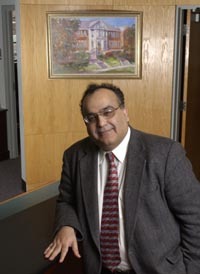 Professor Amir Faghri is currently Distinguished Professor of Engineering and Distinguished Dean Emeritus at the University of Connecticut. He was formerly the Dean of the School of Engineering from 1998-2006 and Head of the Department of Mechanical Engineering from 1994-1998 at the University of Connecticut. As Dean, he was responsible for five engineering departments, five major research centers, and 10 Ph.D. and 12 undergraduate degree programs. During his tenure as Dean, he dramatically expanded resources for faculty and student bases; built strong linkages with numerous constituents; and fostered research flexibility and excellence. In addition, Dr. Faghri successfully attracted corporate and alumni support to establish 17 endowed professorships, including 11 chair professorships; increased freshman enrollment by 116%; increased the number of valedictorians and salutatorians admitted per year to the School of Engineering from just seven to 32; increased the number of merit scholarships by 300%; and added three new buildings/facilities with more than 140,000 sq. ft. Dr. Faghri developed major initiatives and incentives to promote quality research and graduate education, including three new major research centers, with significant support from the state and federal governments, as well as the private sector. While holding such academic and industrial positions as distinguished and chair professor, department head and Dean, Dr. Faghri authored four major books, more than 310 archival technical publications, including 225 journal papers, and 13 U.S. patents as the principal inventor. His newest book, Advanced in Heat and Mass Trasnfer, was published in 2010. He has served as a consultant to several major research centers and corporations, including Los Alamos and Oak Ridge national laboratories, Intel Corporation and Exxon Mobil. He has also served on the board of directors of both public and pivate companies. As a principal investigator conducting research in heat and mass transfer, he has received numerous external research contracts from the National Science Foundation, National Aeronautics & Space Administration, Department of Defense, Department of Energy, and various industrial companies. Dr. Faghri’s technical productivity is further complemented by his service on the editorial boards of eight scientific journals. Dr. Faghri has received many honors and awards, including the prestigious 1998 American Institute of Aeronautics & Astronautics (AIAA) Thermophysics Award, the 1998 American Society of Mechanical Engineering (ASME) Heat Transfer Memorial Award, the 2005 ASME James Harry Potter Gold Medal, and 2010 ASME/AICHE Max Jakob Memorial Aawrd. Dr. Faghri received his M.S. and Ph.D. degrees from the University of California at Berkeley (1974, 1976) and a B.S. with highest honors from Oregon State University (1973).